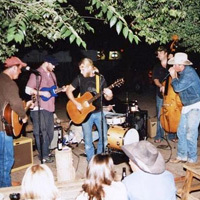 The Doodlin' Hogwallops began 6 or 7 years ago in an alley on the northside of the tracks in Alpine, TX. Since then they have grown to be the foremost honkytonk band in the Transpecos region, despite the fact that on most occasions there are only three of them. But, what a big sound the three of them make. From heart wrenching original country songs to farces that make old women pee themselves, The Doodlin' Hogwallops have it in their set list. No song is too offensive, unless young children are present. No need to warp the young and impressionable, because they will get there eventually. Come out and see what all the fuss is about.